Maximize your program and train like a pro by adding this upgrade kit to your P90X2 base kit. Includes the premium pro grade equipment and 2 additional extreme P90X2 workouts that will help you take your training and results to the absolute max. Serious training requires serious tools. 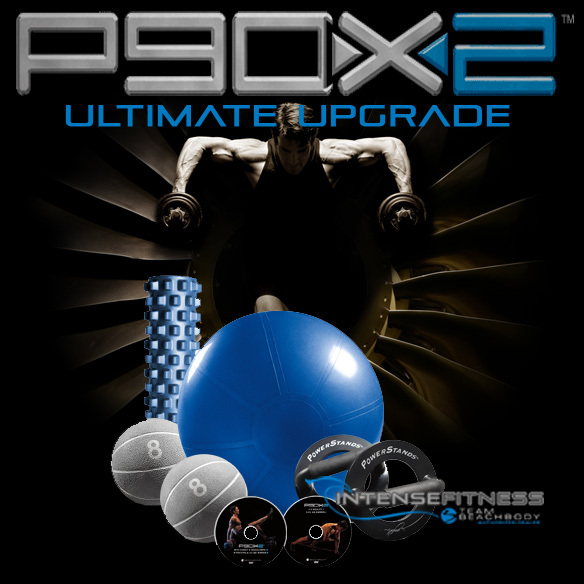 This upgrade kit contains key professional grade equipment plus 2 additional extreme P90X2 workouts. Add it to your P90X2 base kit to optimize your workouts, helping you achieve pro level results. V Sculpt and X2 Chest + Shoulders + Trisadd these workouts to your P90X2 program for even more variety. Premium foam roller with uneven and raised nodules to get deep into muscle tissue. Sturdy enough to balance on and heavy enough to help you sculpt your abs and other muscles. Strengthen and sculpt while lessening the strain on your wrists or forearms. Available on DVD or Blu-ray. Make your selection from the drop-down menu.